1 Tuner + 1+ non-Tuner monsters If this card battles an opponent’s monster, your opponent cannot activate cards or effects until the end of the Damage Step, also that opponent’s monster has its effects negated during the Battle Phase only. If this face-up card in its owner’s control leaves the field because of an opponent’s card effect: You can target 1 Machine monster in your GY; Special Summon it. Samurai Destroyer is a generic Synchro monster that is part Ancient Gear Golem part Colossal Fighter. Good stats for Level 7 Synchro. Destroyer locks opponents down when attacking, negating all opponents monster effects during the Battle Phase, and stops any cards or effects your opponent has from activating. Battle traps like Mirror Force aren’t going to be saving the opponent, and Quick Effects that could destroy Destroyer won’t be a problem either. Destroyer is still vulnerable against grave effects, as well as flip effects like Ryko. When Destroyer leaves the field (destruction not needed) from an opponents card effect, you get a free Machine monster in your graveyard. You don’t even need to run Machine-Type monsters, you can just get Destroyer back over and over. This card can be an added bonus in ABC decks or Machine-based decks using a variety of different monsters like Gear Golems, Gadgets, and DARK Machine monsters. Synchros are falling out of popularity and use, but there are still some that warrant consideration. This monster’s great! Robo Samurai over hear is a Level 7 Earth Machine-type Synchro Monster with 2600 Atk and 1400 Def. Any monster that battles with Samurai Destroyer has its effects negated and your opponent cannot activate cards or effects during that battle. This effect does not target and can be used multiple times if it has multiple attacks. It offers nothing if you’re attacking directly. Then if your Samurai Destroyer leaves the field by an opponent’s effect, you get to target a grave machine for revival. It can replace itself with itself. 2600 Atk isn’t as high as it could be, but for a generic Level 7 Synchro Monster, this is definitely a good option for the Extra Deck. A card that made my Top 10 for Circuit Break but not on the overall one is getting reviewed today, a new generic Level 7 to use with Destrudo, meet Samurai Destroyer. Samurai Destroyer is a Synchro that requires only a Tuner and one or more non-Tuners, so he is as easy to summon as the other Level 7 Synchros. If Samurai Destroyer battles an opponent’s monster, your opponent cannot activate cards or effects and the monster battling with this card has its effects negated during the Battle Phase. That Armades effect is great for getting attacks through, which is why Armades is still a good Level 5 Synchro to this day and also a reason Number S39: Utopia the Lightning sees play in most decks with Level 4s. 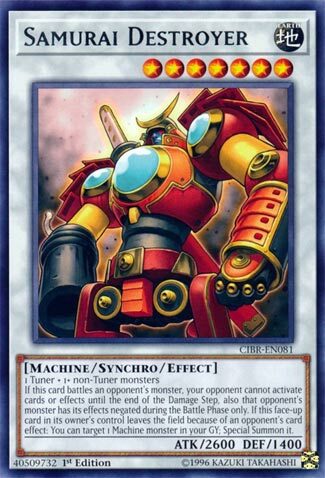 Not only this, but Samurai Destroyer can also summon a Machine if it leaves the field because of an opponent’s card effect. Nice Colossal Fighter like effect against card effects, if your opponent uses a Raigeki to get rid of this, you can get it right back. This thing can also summon ABC-Dragon Buster if you play ABCs and play Destrudo in the deck, which all ABC players are likely doing now. Also with 2600 ATK, it will be hard for the opponent to kill this via battle. This is a cool Synchro combining effects from two great Synchros of the past, make room for this guy in your deck if you can. If I recall, this card made my Top 10 list for the set. I’m still fond of it. We have a generic Level 7 Synchro, who is a Machine, Earth, and has 2600 attack. He kinda looks like an old school Power Rangers Megazord. He can do a lot, he prevents the opponent from activating cards or effects until the End of the Damage Step AND negates their effect during the Battle, making his 2600 attack likely enough to power past most anything. Oh, and when he leaves the Field (while face-up) via card effect, you get to Special Summon a Machine from your Graveyard. The Extra Deck IS crowded, but this is one you might want to make room for.